When we last checked in on Safari Download Enabler, the browser plugin had just added in [Finder], a built-in method for pointing the saved file to a directory on the iPhone, iPad, or iPod Touch’s filesystem. Before the previous update, Safari Download Enabler would require switching to another app, such as iFile. The initial switch to [Finder] didn’t make iFile obsolete, however, because it was impossible to launch apps from [Finder]. The 1.4-3 removes more of the madness involved in switching between Safari and iFile. [Finder] can now open saved files, albeit in a limited way. Currently files can only be opened in iFile, myFile, or Safari. (If you use BrowserChooser to set your default browser to something other than Safari, certain items will open in your set browser, while others will open in Safari.) Safari can then redirect most files to other apps. Opening non-media files through Safari a little clunky, which keeps it from being a perfect iFile replacement, but I was able to pass a sample resume from [Finder] to Safari to the iWork Pages app without much fuss. 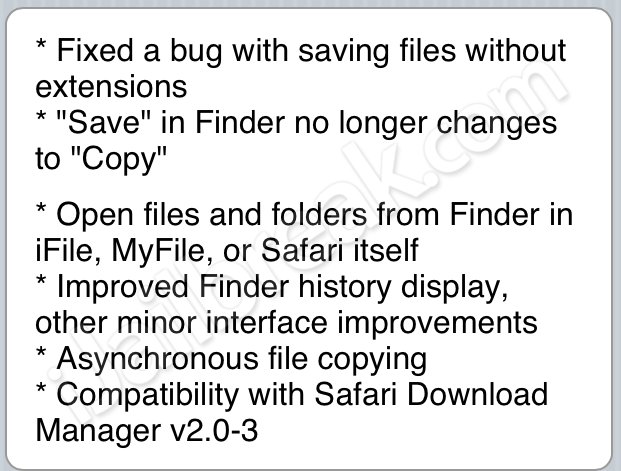 Safari Download Enabler change log. Safari Download Enabler can be found in the BigBoss repository on Cydia. Do you prefer Safari Download Enabler to the new Safari Download Manager? Is [Finder] good enough to replace MyFile and iFile? Share your thoughts in the comments section below.